Livingston’s Congregational Church boasts some interesting and beautifully rendered windows. Several center panels bear the signature “Charles”; his art works hand in hand with the pastor's words, provoking souls to pause and ponder. Fortunately for me - and for you! -, the motif pictured is dear to Amanda Neufeld, the first of my lovely nieces, who graces today's post in the following guest-blog. Enjoy. 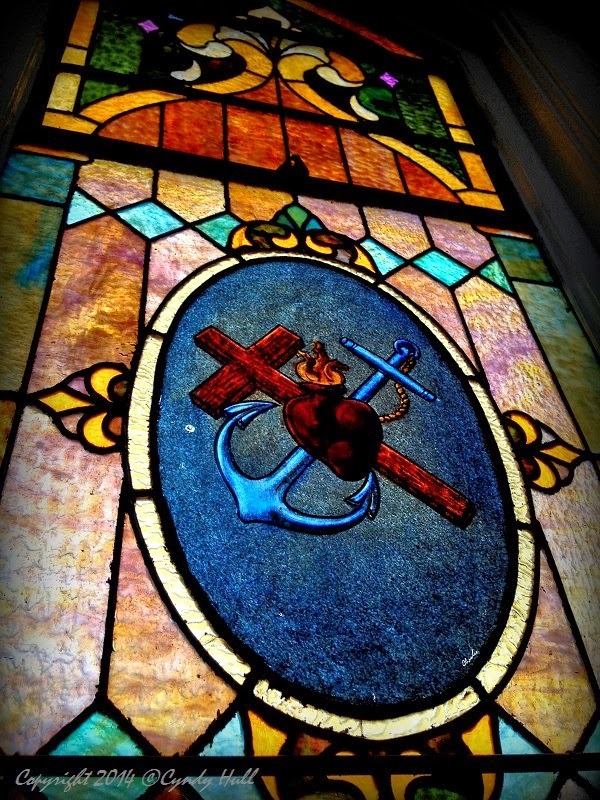 Hearts, crosses, and anchors. Images often seen in ink faded from black to green on time-worn skin. Among pinup girls and tributes to mothers, or on the distended forearms of a spinach crazed sailor man (toot toot), these symbols so ubiquitous that one can easily forget what it is they symbolize. Seen here, however, backlit by a snowy Sunday morning, some of their sacredness seems restored. A Sacred Heart glows with a flame that seems gentle and inviting, a fire that burns with Holy love, that refines what it touches. Why? "Blessed are the pure of heart, for they shall see God" (Matthew 5:8). As a people, we are raw, unable to purify ourselves, and, thankfully, not required to. The Cross, seen so often that it can be overlooked. So simple a symbol, and yet, "the intersecting lines mark a center, from which a radiance or life itself flows outward. The cross of Christ, like the tree of life, became the center of the world." I think I might need to add an anchor to my tattoos, not carrying on a nautical tradition, or in homage to everyone's favourite squinting sailor. A reminder of the generations who used secret symbols to share their faith, who spoke without speaking of the Lord they loved and in Whom they lived. Or I could spend more time admiring stained glass windows. The windows in this church are truly lovely and you captured the beauty of this one. I like the guest blog, as well. We were blessed to have you worship with us. Thanks for the beautiful pictures of the church, and the blog post. I enjoy your writing. Hope you can come back often. Thanks, Pastor Durgan. We also loved the old illustrated bible in the library, and Jeremiah's custom art tour. What a perfect commentary - I learned something. Thanks Amanda. Enjoyed sharing your exploratory adventure.